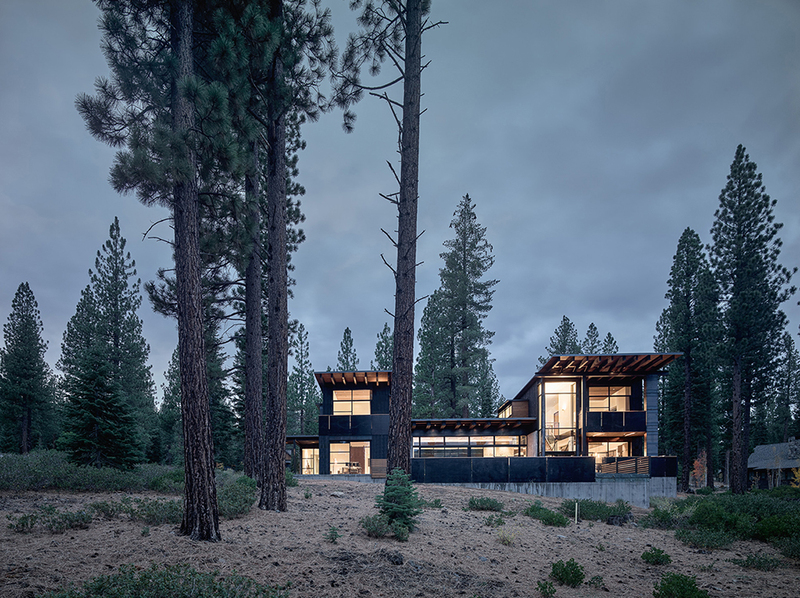 The charred cedar–clad structure in Truckee, California, was designed by architect Greg Faulkner for a family with grown children that wanted a place to host friends. The 5,700-square-foot getaway features glazed screens surrounding the living and dining areas. A travertine marble slab fireplace anchors the space; the floors are California walnut. The dining area features ebonized quarter-sawn oak cabinetry with travertine work surfaces. To maximize space for guests, the house features six private sleeping areas, including two that do double duty, like this space that incorporates an office. The structure is divided into two solid vertical volumes connected by glazed living areas. The cedar cladding and steel panels reflect the hues of the surrounding forest.